Originally published in VICE on April 28, 2015. As I walked through the streets of West Baltimore on Monday evening, small bright green opiates littered the sidewalk, pills left over from when the local CVS pharmacy was looted hours earlier. The air felt thick and musty—police had fired teargas canisters near the Penn-North subway station. By 6:15 PM, clouds of smoke were pouring out of the empty pharmacy, which filled with flames. At one point, protestors cut the hose that was being used to put out the fire. Except for a few young activists hoisting “Justice 4 Freddie Gray!” picket signs, most people hanging around were not protestors. 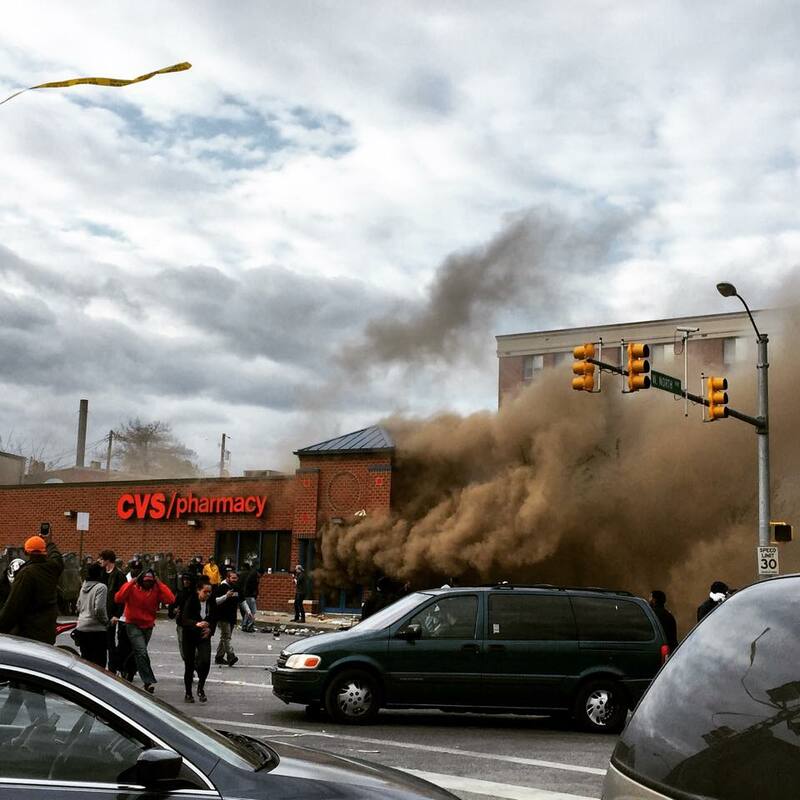 The majority of Baltimoreans on the streets were just snapping photos and watching the events unfold as spectators. 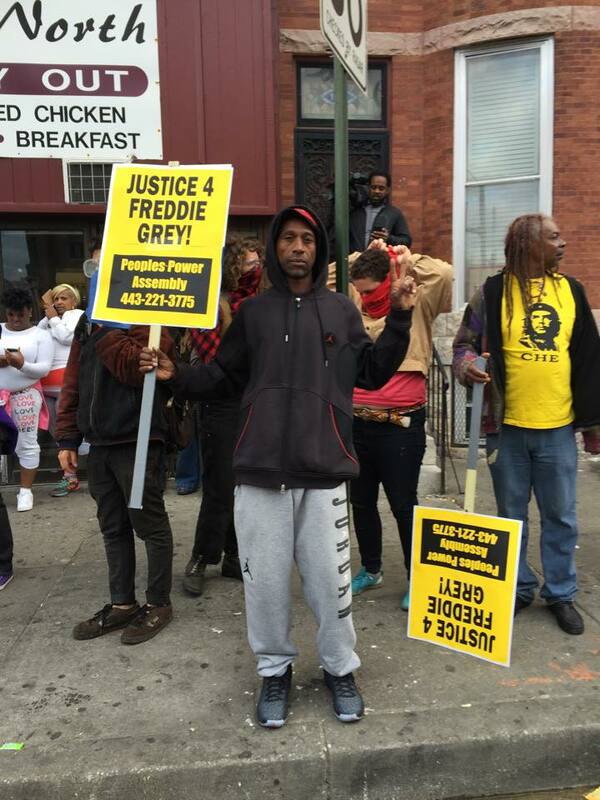 Unlike Saturday’s protests, where thousands proudly marched, chanted, and gave speeches about accountability and justice for Freddie Gray, a 25-year-old black Baltimore resident who suffered a fatal spinal cord injury while in police custody earlier this month, Monday felt perilously chaotic. Saba Nazeer, a local resident who works with the Right to Housing Alliance, a Baltimore housing justice organization, came out to watch one standoff unfold between high school students and the police. The cops knew to meet the teenagers because a flier circulating earlier on social media called for students to meet for a “purge” out by the mall after school. (Frederick Douglass High School is across the street from Mondawmin Mall.) Dozens of cops were ready to meet the 75 or so students that showed up. Things escalated quickly. Students hurled bricks, rocks, and bottles at the police; cops sprayed mace and teargas. 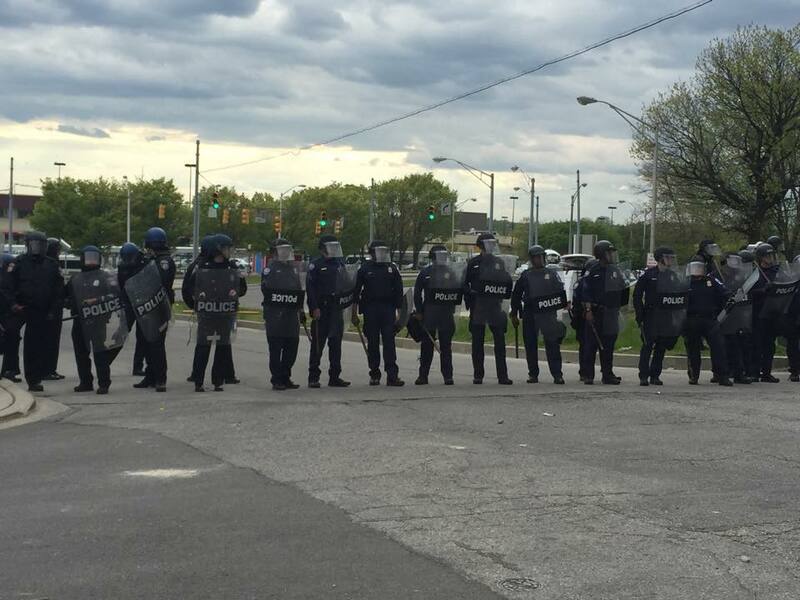 Fifteen officers were injured in clashes around the city, six seriously, and two were hospitalized Monday evening. A national conversation on police brutality broke out after the deaths of Michael Brown and Eric Garner last year, but local cops’ excesses have been a major political issue in Baltimore for a while now. A Baltimore Sun investigation released in September found that the city paid out $5.7 million in judgments and settlements in cases related to alleged police brutality and civil rights violations since 2011. Even before Gray’s death, the city was haunted by two recent high-profile incidents of unarmed Baltimore black men dying in police custody— Tyrone West in 2013 and Anthony Anderson a year earlier. Cops faced no charges following the deaths of either men. Since West’s death in July 2013, Baltimore community members have convened outside City Hall every Wednesday to call for the police to be charged with homicide. (These weekly demonstrations are locally referred to as “West Wednesdays.”) Activists keep count— Monday marked day 648 since West’s death. While an independent review issued in August determined that the police did not use excessive force, some still insist they saw cops kick West in the head, yank him by his dreadlocks, and beat him with batons. In September, an alarming video surfaced that showed a Baltimore cop repeatedly punching a man. Unable to ignore the damning footage, Mayor Rawlings-Blake vowed to develop a “comprehensive” plan to address police brutality in the city. A few months later, however, she vetoed a bill that would have required city police to wear body cameras. Rawlings-Blake has said she supports the measure, but felt the specific legislation proposed was not within the City Council’s authority. Freddie Gray was arrested on April 12 after making eye contact with police and taking flight, but more than two weeks later the public has still not been given any meaningful details about how he sustained his fatal injury. (He died on April 19.) Last week, Baltimore Police Commissioner Anthony Batts admitted Gray was unbuckled when police placed him in a van despite being shackled and handcuffed, and noted that Gray’s multiple requests for medical attention were ignored. Other findings from the department’s internal investigation, however, have not been made public. More information will be released on May 1— a deadline Batts set to share findings with Baltimore’s State Attorney. Tensions between political leaders, police, and community members are unlikely to abate any time soon, but multiple community cleanup efforts are being organized on social media today in West Baltimore. One group will be meeting back by the Penn-North subway station at 10 AM, and another will start at 2 PM by the University of Baltimore. Organizers have asked individuals to bring their own gloves, trash bags, brooms, and food.